This is a shopping haul from my recent trip to Michaels. 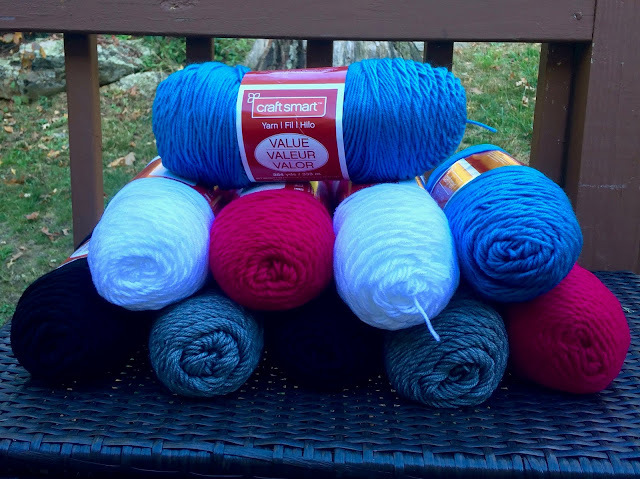 With skeins of yarn at $2 and a 20% everything including sale items, this was one major deal. $16 for 10 skeins of yarn!! And this isn't old yarn from a dusty thrift store. This is brand new! Now I have to think of what to make. Any ideas? I'm sure I could whip up a few more granny squares. Those are fun. And there are so many things to do with granny squares. I could make another scarf or a blanket or maybe I could try something new altogether. I would like to make the Halloween Garland I mentioned in my 14 Awesome Autumn Pins post. I would need to use some orange and green from my stash, but I could use the black and white for the ghosts and spiders. The white, blue and pink would be perfect for the Owl Mug Cozies I pinned. The original poster did not use those colors, but I think they would work out great. What do you think I should make? Comment below for ideas. Also, do you have a favorite yarn? Comment below with the yarn you love. As a reminder, I'm participating in the Ultimate Blog Challenge! *UPDATE - I previously said $16 for 20 skeins of yarn. I meant 10! That would have been a crazy deal, though! Timely haul! I've never seen this yarn at our local Michael's - they seem to sell only the more expensive stuff. I like to work with Wool Ease (fortunately, I don't have a problem with wool althugh I realize many people do) it is so smooth and just glides on my hook. So many yarns call out to me but I already have too much on hand. When I bought it I thought it must be a new brand. It's not one I've bought before. I usually buy RedHeart at Walmart, or caron's sometimes. I was getting a little low, lol, but I'm sure some might say I had plenty! I don't Crochet although I love looking at the yarns and all the colors it comes in. With these pretty colors a hat might be nice as it will be getting cold soon. Or even a shawl. A hat is a great idea. I've never made a great shawl, so maybe that will be next on the list! WOW you sure get a great deal! I don't know or crochet but my mom use to knit beautiful sweaters with motifs in them. My sister knows lap blankets and donates them to nursing homes around the holidays. That might be a idea. In a novel I read recently, a woman knit hats for newborn babies to wear as they left the hospital. Isn't that a sweet idea? I'm actually reading a series by that author & all the female characters, except one, who crochets.